(Nanowerk News) A tiny mirror could make a huge difference for scientists trying to understand what's happening in the micron-scale structures of living cells. By growing cells on the mirrors and imaging them using super-resolution microscopy, a group of scientists from universities in the United States, China and Australia have addressed a problem that has long challenged scientists: Seeing the structures of three dimensional cells with comparable resolution in each dimension. Cells are normally grown on transparent glass slides for microscopy examination. The new technique uses the unique properties of light to create interference patterns as light waves pass through a cell on the way to the mirror and then back through the cell after being reflected. The interference patterns provide, at a single plane within the cell, significantly improved resolution in the Z-axis - what scientists see as they look directly into a cell perpendicular to the slide. This improved view could help researchers differentiate between structures that appear close together with existing microscope technology - but are actually relatively far apart within the cells. Microscope resolution in the X and Y axes is typically superior to resolution in the Z axis, regardless of the microscopy technique. The mirror approach works with super-resolution microscopy as well as with other technologies. Reported in the Nature journal Light: Science & Applications ("Mirror-enhanced, axial narrowing, super-resolution microscopy"), the technique was developed by scientists at Peking University, the Georgia Institute of Technology, and the University of Technology Sydney (UTS). "This simple technology is allowing us to see the details of cells that have never been seen before," said Dayong Jin, a professor at UTS and one of the paper's co-authors. "A single cell is about 10 micrometers; inside that is a nuclear core about 5 micrometers, and inside that are tiny holes, called the 'nuclear pore complex,' that as a gate regulates the messenger bio-molecules, but measure between one fiftieth and one twentieth of a micrometer. With this super-resolution microscopy we are able to see the details of those tiny holes." Being able to see these tiny structures may provide new information about the behavior of cells, how they communicate and how diseases arise in them, said Peng Xi, a professor at Peking University and another of the paper's co-authors. "Previously, the vision of biologists was blurred by the large axial and lateral resolution," he said. "This was like reading newspapers printed on transparent plastic; many layers were overlapped. By placing a mirror beneath the specimen, we can generate a narrowed focal spot so there is only one layer of the newspaper to read so that every word becomes crystal clear." The new system, he noted, allows scientists to see the ring structure of the nuclear pore complex for the first time, and the tubular structure of the human respiratory syncytial virus (hRSV). "With this simple, but powerful weapon, biologists can tackle many interesting phenomena that were invisible in the past because of poor resolution," Xi added. While changing the optical system was relatively simple, growing cells on the custom-made mirrors required adapting existing biological techniques, said Phil Santangelo, another co-author and a professor at Georgia Tech and Emory University. Techniques for growing the cells on the mirrors were largely developed by Eric Alonas, a Georgia Tech graduate student, and Hao Xie, a student in the Ph.D. program of Peking University and Georgia Tech. "Most people are not growing cells on mirrors, so it required some work to get the cell culture conditions correct," Santangelo said. "We had to make sure the mirror coating didn't affect cell growth, and staining the cells to make them fluoresce also required some adaption. Ultimately, growing cells on the mirrors became a simple process." The new technique, known as mirror-enhanced, axial narrowing, super-resolution (MEANS) microscopy, begins with growing cells to be studied on a tiny mirrors custom-made by a manufacturer in China. A glass cover slide is placed over the cells, and the mirror placed into a confocal or wide-field microscope in the place of a usual clear slide. The technique improves axial resolution six-fold and lateral resolution two-fold for Stimulated Emission Depletion (STED) nanoscopy. The ability to increase the resolution and decrease the thickness of an axial section without increasing laser power is of great importance for imaging biological specimens, which cannot tolerate high laser power, the researchers noted. For scientists attempting to study structures and molecules inside cells, the interference effects can make a dramatic difference in what can be observed. "The two waves interacting with one another causes a region between the glass surfaces and the cell to be bright, and other parts to be dark," explained Santangelo, who is an associate professor in the Wallace H. Coulter Department of Biomedical Engineering at Georgia Tech and Emory University. "They cause light to be removed from some locations so you get darkness, and there is a bright spot in a specific region rather than being all bright." 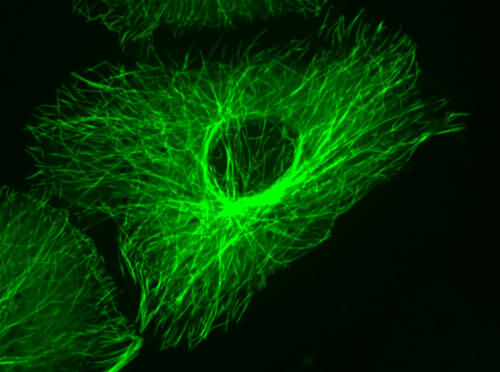 Santangelo believes the technique could find broad applications for scientists using fluorescence microscopy to examine cells and subcellular structures. Further research could lead to improvements such as the ability to make the mirror's surface movable, allowing more control over how the cells can be imaged. "There is more to do with this," he said. "We have demonstrated a basic topic that can be applied now in other ways." The time differences between Australia, China and the United States provided a challenge for the team's collaboration, but the researchers say the work was very worthwhile. "The development of the mirror-enhanced super-resolution microscopy is a great example of what collaborative, international and multi-disciplinary research can achieve," said Jin, who is the director of the Initiative for Biomedical Materials & Devices at UTS. "It is a significant achievement for the team, and the field, and one that we're proud to have been involved in."